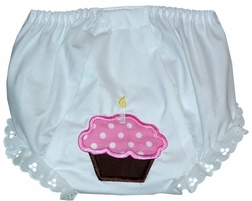 These are the cutest little birthday bloomers and match our birthday cupcake dress. SEE MONOGRAMMABLE BLOOMERS FOR SIZE CHART. Because this item is appliqued, please allow 2 to 3 weeks for it to be crafted for delivery.